What Size Linens Do I Need? Whether you’re planning a backyard banger, corporate event or indoor party, the style and size of linen on each table will help determine the tone of your event. If you’re planning a wedding or any other special occasion, we definitely recommend floor-length linens for a more formal look. If the event is more low-key, lap-length linens are budget friendly while still making a statement. So how do you choose the linen that will look and fit best on your tables? 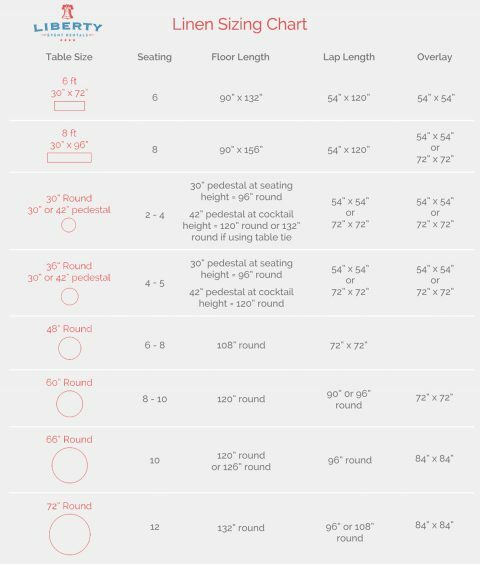 Answer these three simple questions then reference our handy-dandy linen size chart below. It’s that easy! What size and shape is my table? What length do I want my linen to be? Use this helpful chart below to make your decision. Once you have determined your linen size(s), view our linen rental inventory for color and material options! Click Here to see our dedicated linen page! Feel free to call us at 267-314-7368 for any questions on our Linen Rentals in the Philadelphia metro area including: Center City Philadelphia, South Philadelphia, Rittenhouse Square, Washington Square, Northern Liberties, Fishtown, Fairmount, Graduate Hospital, University City, Old City, Passyunk, Bella Vista, Queens Village, Port Richmond, Mainline Suburbs, Media, Newtown Square, Haverford, Villanova, Penn Valley, Conshohocken and Kensington.